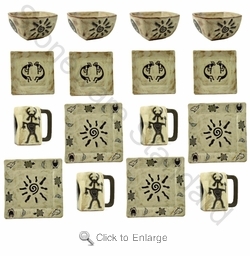 This 16pc square dinnerware set - dream spirit is artistically designed with the same dream spirit theme. Mara's stoneware dinner plate and bowl show a sunburst, the salad plate displays two Kokopellis and the stoneware mug shows a petroglyph. Check out our Spirit - Individual & Complement Pieces to fill out your Mara Dinnerware set.